Born in Oporto in 1981, Miguel followed the strong family ties to the sports scene and dedicated most of his early years to basketball, eventually turning pro at the age of 17. After having already made his debut in the top-tier national league while also being regularly called up to the national teams at a youth level, was forced to retire from basketball at 21 years old due to an injury, shifting his focus to completing a degree in civil engineering at the University of Aveiro. This help lay the foundations to a path that has taken him to Owner and Production Manager at Cimave Construções, where his role and assignments in the court allowed him to transfer skills like Leadership and Management to the different projects he’s been involved ever since. Being a Fantasy Sports enthusiast since his playing days and also a strong believer in the power of technology, he has worked as an Advisor for the RealFevr founders from their early days as a Startup, back in 2013, eventually becoming an Angel Investor for the project in 2015, when the company had released their prototype and was ready to start gathering funds. 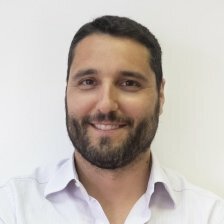 With his increasing engagement with the cryptocurrency ecossystem, it was only natural that he would take a deeper step inside the RealFevr operation and managed the RealFevr ICO.